In pollylined kraft paper bag with outer PP bag of 10-20kgs net each. 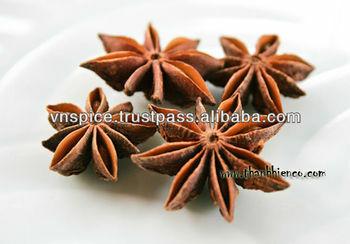 Star Anise comes by its name honestly, with its star shape and a licorice taste similar to regular anise, only stronger. It is about one inch high with eight segments and a dark brown rust color. + Product: Well dired, good smell and tasted, no mould, no fungus, clean. + Packing: In carton boxes, 10-20kgs net each.